The plan by Tesla’s battery partner Panasonic to set up three new assembly lines in the Gigafactory 1 in Nevada by the end of the year, will likely be completed ahead of schedule. The expansion will increase the production capacity by about 30%. The news was announced by Yoshio Ito, head of the automobile division at Panasonic. He declined to mention an explicit date, however. 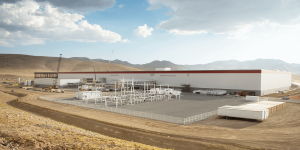 The expansion for the Gigafactory, which was announced this summer, will see the factory have a total of thirteen production lines. In this production dimension, it would be possible for Panasonic to deliver a total capacity of 35 GWh to Tesla, which is the requirement for the company to keep up with their current Model 3 production. As was recently reported, the energy business by Panasonic took a hit in the battery division in the second quarter of 2018. The exact number was a loss of 8.4 billion Yen (75 million dollars). This was mainly blamed on the need to expand production lines and factories, namely the Gigafactory 1. Panasonic is calculating that the business with the Model 3 and Tesla will yield results starting in October, due to the increasing demand for the vehicle.